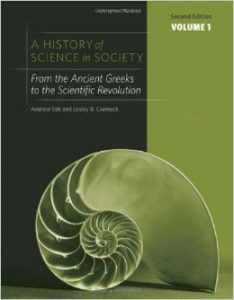 In many older textbooks, the Ancient Greeks are often referred to as the fathers of ancient astronomy, developing elegant theories and mathematical formulae to describe the wonders of the cosmos, a word that, like so many others, came to us from the Greeks. In fact, this assumption is incorrect and, whilst the Ancient Greek astronomers made huge contributions to astronomy, their knowledge was built upon the solid foundations laid by other great cultures. The Mesopotamian and Zoroastrian astronomers and astrologers, in the Fertile Crescent and the empty deserts of Persia, made many sophisticated observations and devised complex theories to describe cosmological phenomena. This ancient wisdom passed into the hands of the Greek philosophers, greedy for knowledge, when Alexander the Great conquered the region, in 331 BCE. Greece also lay at the crossroads of many trade routes, so ancient knowledge from the Indian Vedas and the Chinese astronomers further contributed to the store of insight accumulated by the Greeks. The Ancient Greek philosophers refined astronomy, dragging it from being an observational science, with an element of prediction, into a full-blown theoretical science. The ancient astronomers used astronomy to track time and cycles, for agricultural purposes, as well as adding astrology to their sophisticated observations. They did not really generate any theories concerning astronomy, and were more concerned with what was happening and when, without addressing the why, other than vague attributions to Gods and astrology. The Greeks kept the idea of Gods and omens, but began to theorize about the underlying structure of the universe, pondering why the Sun, planets, and stars moved. Ultimately, many of their ideas were based upon theology and heavenly perfection, so were incorrect, but the keen minds of the Greek philosophers were the first to attempt to find a Grand Universal Theory. They tried to uncover the hidden laws of creation long before Einstein, Hawking, and the great theoretical physicists, who are the distant descendents of the Greek astronomers, and certainly speak the same language of mathematics. The Ancient Greeks encountered the great civilization of Mesopotamia as early as the 11th Century BCE, as they settled along the coast of Turkey. They also encountered the Persians and the Egyptians, absorbing customs and knowledge from these great cultures. As a maritime people, the Greeks understood the value of reading the stars as an aid to navigation and, by the 6th Century, Ancient Greek seafarers of the Ionian culture could read the stars like a map, and understood the patterns and motions of the celestial sphere. Greek astronomy might have ended there were it not for the rise of the Greek philosophers. Their insatiable quest to understand the undercurrents that drove the universe, and read the ebb and flow of natural cycles governing the earth and heavens became an obsession. The Greeks developed a pantheon of Gods, mainly because of cross-fertilization from Eastern cultures, but they were not satisfied with purely theological explanations for phenomena, and wanted to understand how and why things worked. Perhaps they saw their theories as reading the mind of the gods and revealing what they believed to the perfection of nature. To the Greeks, the universe was a machine that ran upon mechanical and mathematical principles, which could be deduced through logic and reasoning. One of the first Greek ancient astronomers, and the first notable Greek philosopher, was Thales, who lived at the beginning of the 6th Century BCE. Few written records exist and information about his work must be pieced together from the writings of later philosophers.However, it is believed that he successfully predicted an eclipse, in 585 BCE, although he probably referred to Babylonian records for this. He is also credited with inventing trigonometry, in an early example of the strong link between astronomy and mathematics.Other discoveries attributed to him are measuring the apparent diameter of the sun and recognizing the importance of the star constellation Ursa Minor (The Little Bear), as a guide to navigation for seafarers. Whilst difficult to ascertain from the scattered records, it seems that he believed that the earth was flat. Anaximander, another great early philosopher, better known for his ideas about evolution, was the first Greek philosopher to create a cosmological model. He proposed a theory explaining how the universe worked and revealed what he felt were the hidden processes guiding the movement of the planetary bodies. His major contribution was to imagine the earth as hanging in space, with the other heavenly bodies describing circles around it. He also brought the idea of depth to the model, for the first time proposing that the heavenly bodies occupied three-dimensional space, envisaging them as lying different distances away from the earth. Anaximander believed that the earth was cylindrical in shape, about 1/3 as high as its diameter, and imagined it to be surrounded by air and then fire, ‘like the bark of a tree.’ The inhabited portion lay on top of the cylinder, surrounded by an ocean, and it is suggested that he believed the other flat surface of the cylinder contained land, although he did not specify whether he believed it to be inhabited. All of this was surrounded by a ring of air, followed by rings of fire shrouded by mist. He described these as like chariot wheels; the rims were hollow and filled with fire, and the light from the heavenly bodies emanated from openings in these wheels, which allowed people to see the fire. In his model, the sun and moon were further away than the stars, and eclipses were accounted for by these holes becoming blocked. Of course, to modern eyes, this seems to be a very backward way of looking at the universe, but we have to remember that Anaximander had no concept of gravity, and could think of no other model that would prevent the sun, moon, and stars from plummeting to the ground! He never fully explained why the heavens did not move around the earth perfectly and went around at an angle, giving us the seasons. Anaximander’s other great contribution was the idea of infinity and the tantalizing possibility that the universe could be unbounded. He also created the idea of ‘balance’ to explain how the earth floated in space, using equilibrium. His model created more questions than answers, but that is what philosophers feed upon! Pythagoras, another philosopher better known for mathematics, also contributed to the knowledge of the Greek philosophers by postulating that the earth was spherical, a huge departure from Anaximander’s model. Famously, he proposed this idea because he noticed that ships disappear below the horizon when they sail away, implying that the surface of the earth is curved. He also proposed that, if the moon and other celestial bodies were spherical, then it made sense that the earth would be too; Pythagoras saw spheres as the perfect shape. Pythagoras was the first ancient astronomer to suggest that there was a harmony of the spheres, and that the movement of the planets, sun, moon and stars could be described by whole numbers and mathematical precision. His other discovery was that the morning and evening star are the same thing, the planet Venus. 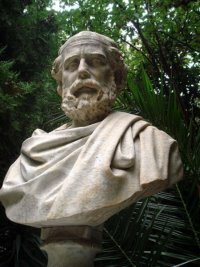 Anaxagoras is one of the first Greek philosophers that we know a little about, as he is mentioned in Greek history. This philosopher was admired by many in Athens and counted the great Socrates amongst his disciples. He proposed various solutions to celestial phenomena and the structure of the universe, explanations that would eventually see him banished from Athens for heresy. He believed that the sun was a huge mass of blazing metal, much larger than the Peloponnese. Anaxagoras also proposed that the heavenly bodies were rock torn from the earth and set aflame by rapid rotation, also suggesting that they were a long way from earth, the reason why we cannot feel their heat. Finally, he believed that the moon was a world much as our own, with valleys, mountains, and ravines, and hinted that it may be inhabited. He reverted to the old idea of a flat earth, proposing that strong winds blowing under it caused it to ripple and give rise to earthquakes. Brilliantly, he suggested that the moon reflected the sun’s light, a true stroke of genius.Heracliedes was the first to suggest the sun as the center of the universe, a concept that would not be accepted until Copernicus, nearly 2000 years later. These two ancient astronomers would influence one of the most famous of Greek philosophers, Plato. As a philosopher who believed that explanations could be deduced, through reason, Plato believed that the entire cosmos was constructed with precision and that circles and spheres, as the most perfect objects, were the key to understanding the universe. His contribution to ancient astronomy was the idea that the stars, sun, and moon were fixed to concentric crystalline spheres, rotating inside one another. Plato proposed that the stars formed the outermost crystal sphere, followed by the planets, the sun, the moon, and the spherical earth at the center. These rotated and gave rise to the motion of the heavens around the fixed earth.However, records and observations soon showed that this model could not fully explain the complicated movement of the planets, sun, and moon. These move across the sky at varying rates, often appearing to move backwards relative to the sky in a retrograde direction. Plato, ever one to complicate matters, decided that this movement was still circular, but his model needed a slightly more sophisticated explanation. Plato’s pupil, Eudoxus, envisioned the universe as containing the static earth at the centre, with the stars occupying the outermost crystal sphere. The sun, inside this sphere, rotated around the earth at the same speed as the stars, but was attached to the astral sphere and also rotated about this axis once per year. If this solar sphere were connected at a 231/2 degree inclination, this would also explain why the stars do not circle the earth on the same plane.The problem with this is that it did not fully describe all of the nuances of the sun’s rotation, so more spheres were added to Plato and Eudoxus’ model. To account for the motion of the moon and planets, the model required at least 55 concentric spheres. Try to build a model of that one! Aristarchus, teacher of the better-known Archimedes, was the first astronomer to make a reasonable estimate of the distances of the sun and moon from the earth. He proposed that the universe was far greater in size than suggested by earlier philosophers, believing that the earth, lying at the center of the universe, was tiny compared to the sphere of the stars. Accordingly, this vast distance explained why the stars do not appear to move relative to each other.Along with Eratosthenes, he also proposed that the stars and sun did not move in the sky, instead believing that the earth rotated about its axis, although this particular idea was not widely adopted. The problem with the idea of concentric spheres was that it did not explain the full complexity of planetary motion, and the model could not explain how the moon and planets varied in size and brightness. Hipparchus (2nd Century BCE) was the first to suggest a new model to explain this and suggest why the seasons varied in length. Hipparchus believed that the earth did not lie at the very center of the universe, but lay slightly off center. Ptolemy took this idea further and expanded upon the idea, proposing the famous theory of epicycles. 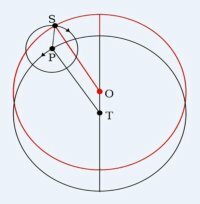 Using trigonometry, Hipparchus and Ptolemy devised the idea of epicycles, where the sun, moon, and planets moved around the earth in circles, but rotated in smaller circles within this cycle. This perfectly explained the sometimes retrograde motion of the moon and planets, and elucidated why the sun and moon were sometimes closer to the earth and, subsequently, larger. Ptolemy has become something of a byword for stubborn scientists because, as observations began to demand more complex theories, he developed circles within circles within circles, his model eventually becoming as complex as Plato’s crystalline spheres. By modern standards, this epitomizes a scientist clinging to an old paradigm and refusing to entertain other explanations.This is an unfair criticism because, considering the knowledge that he had at the time, it was a decent explanation for the structure of the heavens. He tenaciously clung to the paradigm, failing to make the intuitive leap that would be left to later astronomers such as Copernicus. Ptolemy’s observations were meticulous and his work, the Almagest, built upon the work of Hipparchus, was used by sailors and navigators for centuries afterwards when they wanted to know the position of the sun, moon and stars at any time of the year. His theoretical science was suspect but, as an observational scientist, his diligence and accuracy was truly immense.Ptolemy deserves better treatment than he receives; apart from proving beyond doubt that the earth was spherical, he also has some justification for his belief. He pointed out that, if the world rotated, then how could people survive if it was revolving at high speed; he had no concept of General Relativity! The Ancient Greek philosophers were both a blessing and a curse to astronomy. On the one hand, they made accurate measurements and moved the idea of the structure of the universe away from gods and superstition. Ancient mathematicians used geometry to create models and the philosophers used the idea of harmony and balance to describe the underlying motions of the universe.This idea of perfection would influence astronomers for centuries, with the Muslims and Renaissance philosophers seeking to understand the balance of the divine, universal perfection. Newtonian physics is built upon this idea of precision, and it was not until quantum physics, Einstein, and Chaos Theory that this idea was seriously challenged, and people began to accept that the universe might not be perfect or contain a universal harmony. On the negative side, the geocentric model and epicycles of the Greek ancient astronomers persisted for another 15 centuries, certainly influencing later theoretical cosmologists to take the wrong path. After the decline of Rome, the wisdom of the ancient astronomers would pass into the hands of the Islamic scholars, who preserved the knowledge of the Greeks and added their own ideas. This entry was posted in Astronomy, History. Bookmark the permalink.